Sadie began her career by teaching environmental education to school groups who visited an environmental centre in Berkshire, during my work experience for my National Diploma. Since then she has taught in a wildlife park and environmental centre in Devon and done further work experience in Dorset. Finally she moved to Somerset to work as a School’s Liaison Officer at a falconry centre. 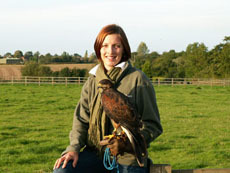 At the same time she was offered the chance to train as an assistant Falconer and this was a turning point of her life. She discovered her passion for Birds of Prey. During the next two years she flew, trained and hunted with a number of hawks, buzzards, falcons and owls. Having received an excellent grounding in falconry, she decided to broaden her horizons and went to South Africa, where she volunteered at ‘African Dawn’ – a bird of prey and wildlife rescue centre. Here she was fortunate enough to work with Black Eagles and many birds of prey native to South Africa. She would have loved to stay but was offered a permanent position with one of the best falcon breeders in the UK and returned during 2006. She loves sharing her knowledge of falconry with others and demonstrating the unique bond between hawk and human to people who may never have had an opportunity to get so close to these amazing birds.